Volunteers picked up more than 300,000 cigarette butts on Saturday from the streets of Brussels, Ostend, Antwerp, Namur and Liège. The big clean-up operation was organised by citizens' collective Leo Not Happy and coincided with the 10th National Day of Cleanliness. 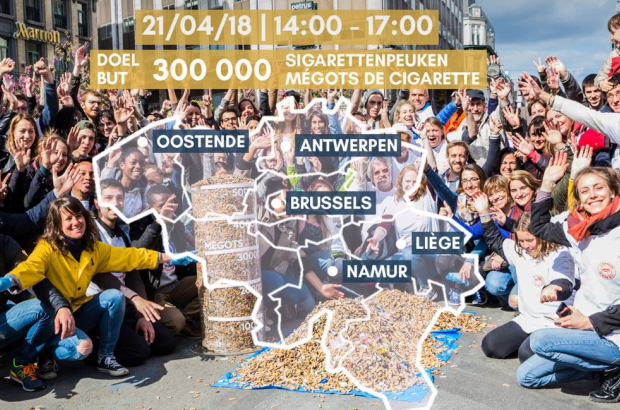 Almost a quarter of a million butts were collected in the capital alone, where 220 volunteers took part in Schaerbeek, Ixelles, Etterbeek and downtown Brussels. "This is an absolute record," said Leo Not Happy founder Adel Saebi. "Our collective is getting bigger - and we're doing more in other Belgian cities outside Brussels. We're also seeing initiatives set up in France and Switzerland, inspired by our work." In Namur, 60 volunteers collected 24,000 cigarette butts in three hours. Elsewhere, residents' associations cleaned their local pavements and playgrounds, using equipment borrowed from municipal street cleaners. In the Bockstael district of Laeken, volunteers collected waste while jogging a 3km route. Congratulations! However, smokers themselves should be made responsible for discarding their cigarette butts. Smokers should carry a small metal tin to store their cigarette butts in. They should be given a fine and participate in community service which includes picking up discarded cigarette butts. Every time there is a cycle race in Belgium there is always lots of cigarette butts, rubbish and plastic bottles. Sadly, the cyclists themselves have a no care attitude and automatically throw their empty plastic bottles everywhere and the environment and wildlife also suffer.